Do you look forward to the end of the day when you can lay down in your bed and relax? A lot of individuals do. If you are updating your bedroom or building a house and finalizing room designs, you should think about how incorporating a restful paint color can help you relax and de-stress after a long day. It may be tempting to choose bright and bold bedroom paint colors. A bright yellow or bold purple may seem like the color that best suits your personality so you may feel that you need to cover your walls with this color. However, when you lie down in bed at the end of a long day, you may not want to be surrounded by a loud color. Something that you may not have thought about with regards to choosing a restful paint color is that this color may vary from person to person. While a cool green tone may be calming for some people, an off-white color or sky blue may be calming and restful for others. 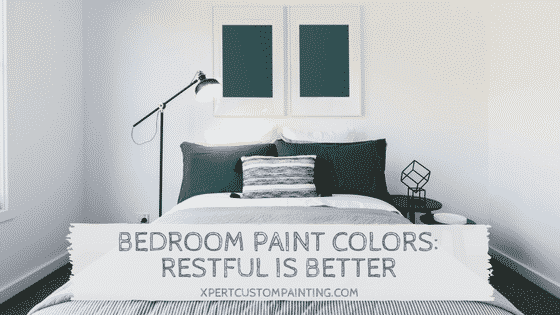 Keep this in mind when choosing your restful bedroom paint colors. In general, restful colors have been identified as gray hues, icy blues, lavenders, and soft neutral greens. Another element to keep in mind is that you do not have to choose just one restful color. Consider spicing things up with an accent wall or wall decals. If you are artistic, you could even paint your own design on the wall! At the end of the day this is your bedroom, so you will need to make it what YOU want! You should also take into account the finish of the restful paint color you are choosing for your bedroom. Glossy finishes can make the room feel much calmer than a stiff matte color. A great part of choosing a restful wall color is that it can set the tone for the whole room. Once you get used to your new paint color, you may be inspired to add more restful elements to the room. These restful elements will vary from person to person but could include things like essential oil diffusers, dim or string lights, or perhaps some tapestries if that fits your style. A perk of making your bedroom more restful is better sleep. If you feel relaxed when you walk in your bedroom, you may have better luck falling asleep. Research has proved time and time again that there are many health benefits to a good night’s sleep. Some of these benefits include improving concentration and productivity, improve your immune function, and the ability to maximize athletic performance with the appropriate amount of quality sleep. Choosing a restful paint color for your bedroom can be the starting point for living a calm lifestyle. Once you feel the benefits from the paint color, you may be inspired to incorporate other restful items into your bedroom or even entire home! We hope that you found inspiration from this article and will feel calm and comfortable in your freshly painted bedroom!